Mog Madness – Round 3 (Riding a Wave of Success). Much to my surprise, I discovered that I’d managed to make it into round 3 of Mog Madness. 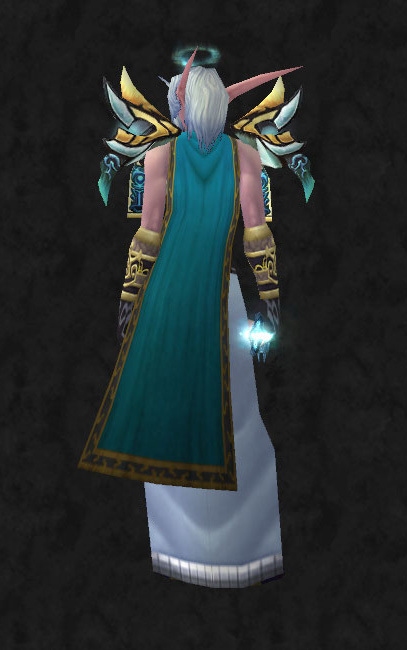 Our task this week was to incorporate the Wavemender’s Mantle into an outfit for either a Shaman or a Hunter. 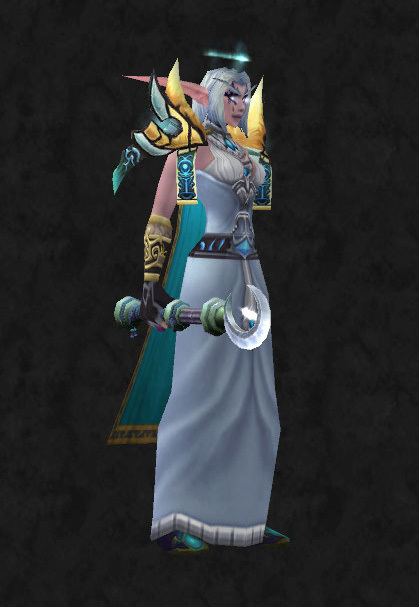 In the end I decided to dress up my Shaman as she was my main during the Black Temple period. After a close look at the shoulders I thought I’d start by finding something to contrast and work with their grey feathery edges. I went for the breastplate because not only does it match colour-wise but it’s polished metal surface adds a tactile contrast to the fluffy looking feathers adjoining it. The “kilt” was an obvious choice to follow on with that concept. There are bronze feathers to tie into the shoulders as well as greys to match up with chestpiece. The weapons presented a bit more of a challenge. I wanted them to reflect the fact that during the Black Temple, she was resto which limited me to choices I would have made back them, i.e. a main hand plus shield. As the colour palette for the whole ensemble is fairly muted, I decided I would try and bring out the bright blue baubles on the shoulders. The mace does that fairly well I think, with both it’s glow and the fact that it’s bronze in colour. The shield was a slightly harder choice but in the end I went with it for two reasons. First of all, it’s over all colours do tie in with the rest of the outfit and secondly, I love shields with faces on them (hey, it’s as good a reason as any other!). I got a pleasant surprise on Sunday, when I discovered I’d made it through into round two of Mog Madness. The small print however gave me cause for concern. An outfit for either a Hunter or a Druid incorporating the Glaive of the Pit or Marrowstrike (same skin). 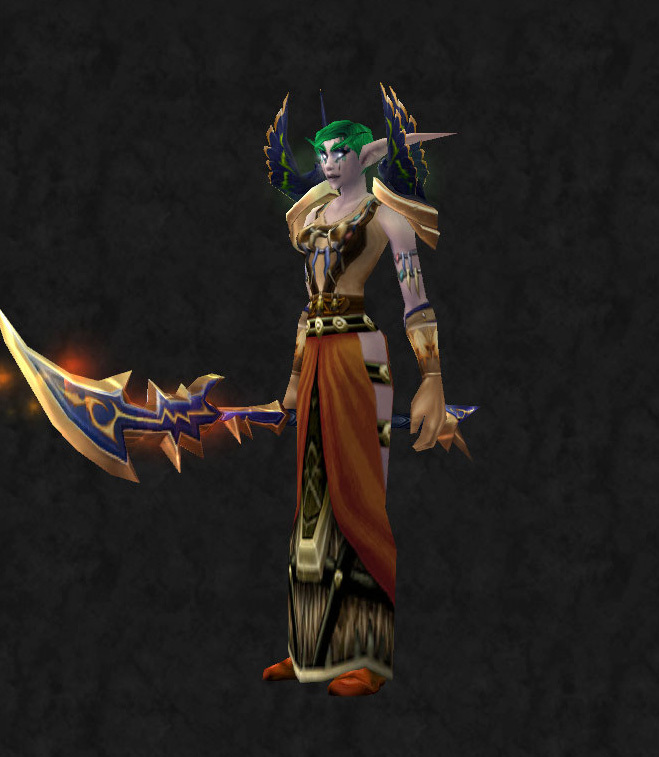 My worst fears were confirmed once I checked out the Glaive on Wowhead. After much bouncing around trying first my Hunter and then my Druid, I finally settled on this. I decided to use the Glaive because of it’s added orange glow (the only difference between the two weapons). That allowed me a slight flexibility in my colour choices, being able to play around with orange as well as bronze and blue. 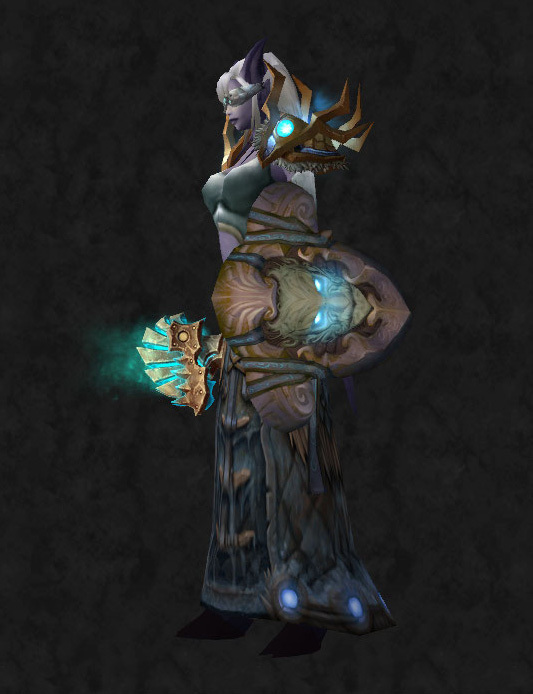 As you can see from my screenshots, I decided to use bronze as my main focal point, with just the odd hint of blue (in the shoulders, bracers and chest) and of course the orange skirt as a bit of a statement. Belt: Fine Leather Sash (the second screenshot is belt less). 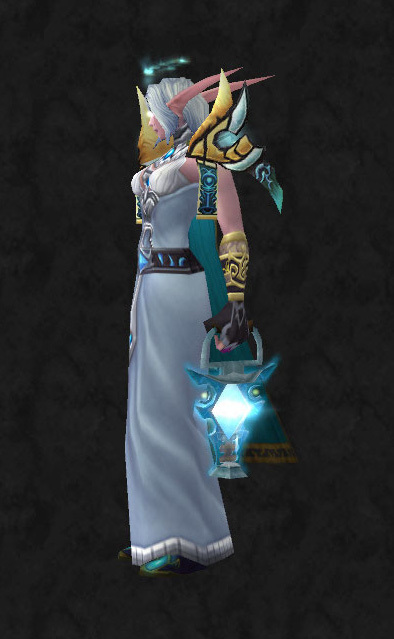 This is my entry into round one of Mog Madness, the transmogrification contest being hosted by J.D Kenada, Effy and Ancient. Of all my characters, the one whose personality is the most defined in my mind has to be Erinys. 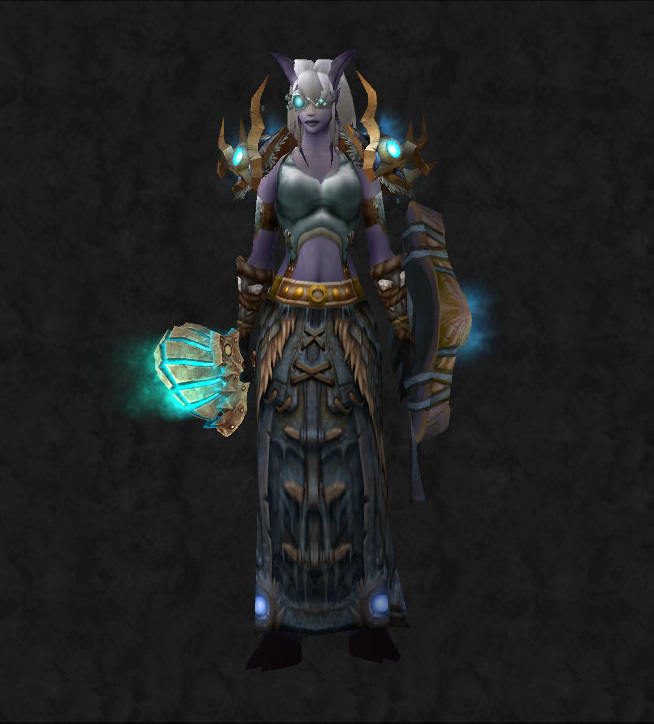 She might currently be languishing in Orgrimmar as a Bloodelf but at heart she is a Priestess of the Moon. 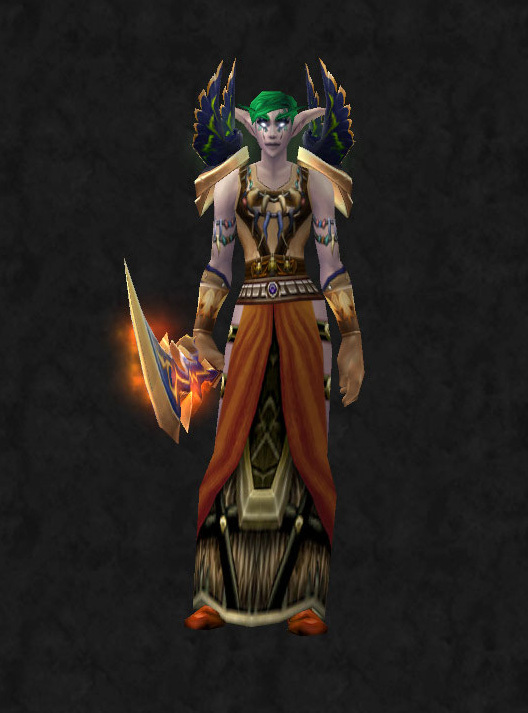 I intend to faction transfer her to back to her roots during MoP and so I thought for round one I’d put together a home-coming ensemble. The starting point for this outfit was a Mooncloth robe. 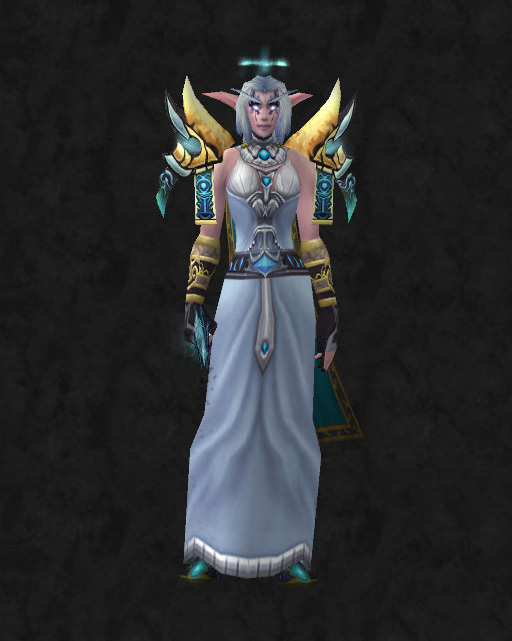 This to me is the quintessential Nightelf Priestess robe and I still have memories of crafting my original one. It was the first WoW item that I had to work towards creating, everything I had before that point, was either from a quest reward, off the AH or from a dungeon. I always imagined that going through the process of first visiting Dire Maul to buy the recipe of a Shen’dralar and then having to farm satyrs must have been hard for a Nightelf. Then having to take the tainted and disgusting fel cloth to a moonwell to purify it in the waters, to produce light from the darkness and weave it into a robe. The very creation of the garment echoes the story of it’s wearer. The shoulders and helm were straightforward choices. I wanted something to accent the cerulean blue of the detailing on the robe and both seemed like perfect fits. The gloves were a little harder but in the end I decided to play on the gold of the shoulders. The off-hand was an easy choice, signifying both her own unshakable and unswerving faith in Elune but also the role she fulfils in Nightelf society. It doesn’t matter how dark the road ahead appears, she believes that her path is lit by the Goddess and in turn tries to provide that light in the darkness to others. “May the stars guide you“. The wand too was an obvious choice, a crescent moon symbolising her belief in the Moon Goddess which blossoms every so often into a burst of stars. When MoP is released and wands become off-hand options for casters, this would be my main-hand choice. I wanted to create something which showed her personality, that combination of (blind) faith in the Goddess as well as dedication to her calling. With the simple colour palette, the symbols of her religion (the lamp and the wand) and of course the halo, I’m happy with the result.